The Parish Church of All Saints stands off the Ashbourne Road opposite the School and serves the villages of Turnditch and Windley. The church is part of the Diocese of Derby and is linked with Christchurch, Belper and St. Anne's, Ambergate. 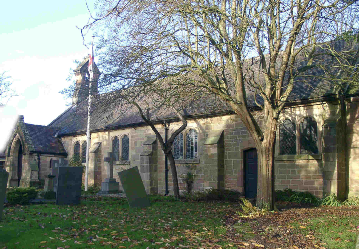 Originally one of the four chapels-of-ease of the mediaeval parish of Duffield, All Saints did not acquire independent status as the church of its own parish until 1847. The long, low aisless church was built in the 13th century as a chapel of ease to Duffield and to serve forest officials and the few other inhabitants in that part of the forest. It has been enlarged over the years, most notably by Giles and Brookhouse of Derby, in 1882-84 when they gave it a new chancel. The date 1630, cut into a massive stone lintel above a door on the south side presumably commemorates an earlier extension. There was a major alteration in 1883 which included he addition of the chancel and porch. The Turnditch and Windley Parish Magazine was first published in 1913. Inside the church is a stained glass window showing St Christopher which came from the redundant church of St Werburgh, Derby, and was installed in All Saints Turnditch after that church closed.